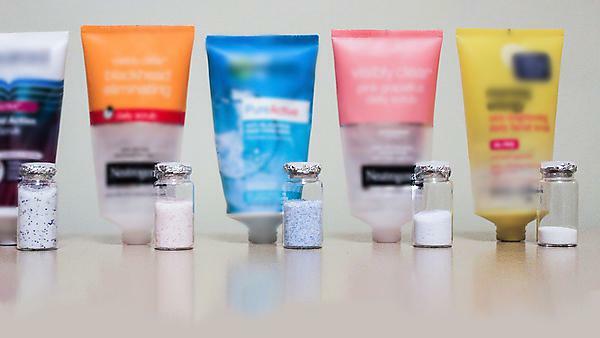 As the government ban on microbeads in cosmetics comes into force, scientists at the University of Plymouth have revealed companies appear to have taken action to eradicate the tiny particles from their products. In August 2015, a study published by the University showed almost 100,000 microbeads could be released in every single application of products such as facial scrubs. But current results using the same methods has so far shown that similar products no longer contain traces of the tiny particles, which measure a fraction of a millimetre. The current research is being led by PhD student Imogen Napper and Professor of Marine Biology Richard Thompson OBE, both of whom were involved in the 2015 study and who have described the findings as "very encouraging”. We've tested the same products after two years and all of the plastic has been removed, all of the microbeads have been removed and replaced with another alternative. It shows that we have a voice and things can be changed. Imogen Napper discusses research that reveals companies appear to have taken action to eradicate the tiny particles from their products. For the original study, researchers subjected six products available on the high street to vacuum filtration and subsequent analysis using electron microscopy showed that each 150ml of the products could contain between 137,000 and 2.8 million microparticles. “I have always said that in order to tackle the problems associated with marine pollution, a holistic approach is needed. That includes scientific research, action from industry and legislation from government and although we can’t say all cosmetic products are completely plastic free, this is a demonstration that things are moving in the right direction. Before that, microbeads had been used for many years to replace natural exfoliating materials in hand cleansers, toothpaste, shampoo and a range of other products. However, their increased use also sparked concerns with scientists indicating they were liable to pass through water treatment works and into the environment, where they were likely to be ingested by marine creatures. University of Plymouth image showing the contrast in levels of microbeads found in cosmetics products, 2015 (top) and 2018.